I started playing Go in October of 2012. I first got interested in the game after reading Hikaru no Go in 2006, but never really got around to playing. Then, when I entered college, I found some kids playing the game in the dining hall. I recognized it instantly as Go, and joined the Go club. I didn't progress much for the first 6 months, reaching about 17k. However, I started to crave an increase in strength, and now currently in August of 2013 I am an 8k, and hope to continue improving. 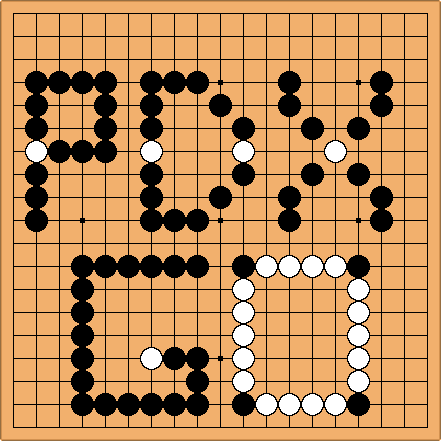 I have heard many people say that Go is a stressful game. I find the opposite to be true. Although I do want to win while playing, and perhaps get stressed sometimes while playing, in the end I find peace in the games. There is a philosophy in Go like no other games that I've played. When you play Go, everything is in the moment. Perhaps you think about moves you will make in the future, but that is all in the same game; you never think about the outcome of a future game. Studying Go has an influence on my life beyond the board. I find that most players at my school are math majors (or in the vein of study), but as a philosophy major, I find that it has just as much of a philosophical bearing as it does a mathematical one. As the 2014 school year has gone on, I have had almost no time to play at all. I've slipped down to more of a 9k level. Hopefully during the summer I can bring myself closer to Dan status. I hope to be 4k by the end of summer 2014. You need half the points plus one"
Despite wanting to win by as many points as possible, it's important to remember that it only takes half a point to win. Make a fist before striking"
Don't attack while weak. A weak stone in an attack will be slaughtered. This one is tough for me. I play very lightly, but it's crucial to deal with the issue at hand instead of running off and doing something else. Let yourself get torn down in the relaxing games. That's where you'll learn your mistakes. Hence my inclusion of only very general proverbs.